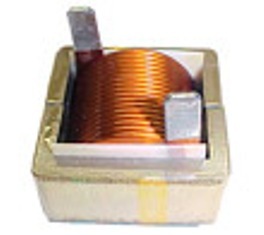 and Four Phase Amorphous Common Mode Choke (CMC). These 4 phase common mode chokes are wound on nanocrystalline and amorphous ribbon cores. Nanocrystalline and Amorphous ribbon cores are ideally suited for 50Hz to 500Hz line frequency common mode filtering. The cores are encased in high temperature plastic casing to provide mechanical integrity. Application includes installation at 50Hz or 60Hz or 400Hz 4-Phase power panels for industrial equipment, machinery, 400Hz military power generator, wind turbine power generator, DC to AC inverter, UPS, etc.